Return the lower bound of a state space. Return the upper bound of a state space. Return the bounds of a state space. Set the lower bound of a state space. Set the upper bound of a state space. Set the bounds of a state space. Return the number of particles. Return the set of particles. The dimension of a particle. The lower bound of the state space. The upper bound of the state space. 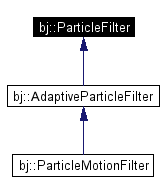 A regular particle filter class. num_particles The number of particles. dimension The dimension of a particle. min The lower bound of the state space. max The upper bound of the state space.